One of the most important and well-loved Australian artists, David Boyd is a prodigiously talented member of the reknowned Boyd Artistic Dynasty. David first studied music at the Melbourne Conservatorium until conscripted into the army in 1942. On leaving the army in 1944 he switched from music to art and enrolled at the Victorian National Gallery Art School. David's initial distinction was as a potter, exhibiting with his wife Hermia first in Sydney in 1948 then becoming regarded as one of the leading potters in Australia and during the fifties and sixties. David's first major painting series commenced with the Explorer Series, a group of symbolic paintings of the Australian explorers. 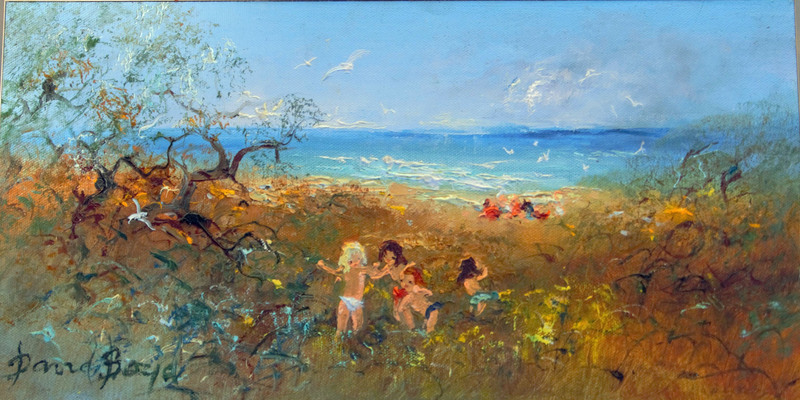 Winning the Italian Government Art Scholarship Prize for Australia in 1961, he moved to Rome with his family in 1962. Paintings from The Tasmanians Series were exhibited to critical acclaim in solo exhibitions in London and Paris in 1963. Since then David Boyd has held many major exhibitions throughout Australia, England and France. Considerable international recognition followed and in 1969 he was invited by the Commonwealth Institute of Art in London to hold a major retrospective of his paintings. The International Academy of Modern Art in Rome awarded David a Membro Albo D'Oro Del Senato Accademio in 1998 and he was awarded an OBE in 2009. David Boyd is revered in Australian art history for his persistent expressions of social justice, his broad academic views, his inspiring representations of innocence and beauty and a deep commitment to art and music.